In Color Order: Color Me Retro Giveaway with Tactile Fabrics! Color Me Retro Giveaway with Tactile Fabrics! Happy Monday! Mondays this month have all been giveaway days haven't they? Let's keep that up with a particularly lovely giveaway (If I do say so myself, hehe!) from Tactile Fabrics! Tactile Fabrics is a small independent fabric shop that specializes in modern organic and cotton fabrics for sewing, crafting and quilting. Today Jennifer has a bundle of Color Me Retro for you! Yay! One lucky winner will receiving a fat quarter of all ten Color Me Retro prints, as well as fat quarters of four coordinating Pure Element solids! Giveaway ends Friday, February 15th at 5pm CST. All entries welcome. Don't worry, you're all winners! Jennifer has a coupon code just for you! Use INCOLOR10 for 10%! PS - I'll announce last week's giveaway winner tomorrow! I would love to have your fabric in my hands. I have a similar fabric like this: Art Gallery Fabrics - Oval Elements - Prune Brown. These fabrics are awesome. Great colors. These prints are great. My mind is already spinning with ideas. This is a fabulous Give Away! Thanx for a chance to win!! I love your line! I can think of 3 things that I want to start RIGHT NOW! with it. :D Thanks for a chance to win some! Love the colors and prints in this line! Crossing my fingers! What a wonderful collection! tks fr the chance! Ohhh, I would be so super excited to win this!! I am in love with your fabric and would be so happy to win this! Wonderful giveaway, just the thing to brighten up a Monday morning. I would love to have this FQ bundle to play with!! The colors are so amazing and would sure help cheer up this dull winter weather. I browsed her shop and I like pretty much everything there. I am really digging Anthology and the Helsinki Retro bundle is pretty cool too. Again, thanks for the chance to win! Vibrant colors.Thanks for the chance. My top fav at Tactile Fabrics is Blooming Lovely - Rings Multi by Anthology Fabrics, a great basic! I visited the shop and I love the Sweet Tea FQ Bundle! It was hard to pick a favorite from Tactile Fabrics...but...<3 the Architextures line! there are an endless cute Springy things I could make with this giveaway, thanks for the chance. Such a fun line of fabrics! I always love coming here to see what you and George are up to! The Stof selection speaks to me. I really like the Bella Turquoise Gray Bundle in the shop. It Certainy is Beautiful Fabric! the moment i set eyes on the Type by Julia Rothman - Keys in Blue HALF YARD i loved it. . . Hmm... What could i make with that? I love these fabrics and can't wait to get my hands on some. I love these prints and solids. I would love to use them. Thank you or a chance to get a bundle of your fabulous new line! I hope to win this stack of your lovely fabric! Awesome bundle. I would love to win it. Thanks for the chance. Oooh, I'm feeling lucky! Releasing your line in Feb was an awesome idea. I NEED COLOR. Your fabric is so full of cherries and lemons and limes, colors I can almost taste. I like Jennifer's Abacus Grey Green Duo. Oh my these are delicious and would go beautifully in my newly decorated 1970s inspired living room! I see cushions, many many cushions! I'm so excited about your line, Jeni!!! What a wonderful bundle of fabric - thanks for the chance to win! Your new line is gorgeous! I can't wait to get some! Thanks for the chance to win! I love this fabric- http://www.etsy.com/listing/122792318/new-stof-fabrics-pure-bursts-white-green? . I've never seen it before! I'm just as excited for the coordinating solids! Can't wait to get my hands on your new line. Oh, lovely! I really would love winning, some colourful fabrics would cheer me up right now! OK I usually have to browse around a while to see some things I love at stores, but the first thing I saw, the Hot Chocolate Geo, I had to add to my favorites. I haven't seen it before and it's awesome! They also carries Citrus Beads which is also on my wish list. When I linked over to Tactile Fabrics, I saw 'Hot Chocolate' - had not seen that before & I really like it! You should be so proud of your fabrics, they are beautiful. Love the colors! Hope I win! I love the hot chocolate geo in white fabric. Or citrus beads. It's hard to choose. This fabric is so beautiful...would be thrilled to win! 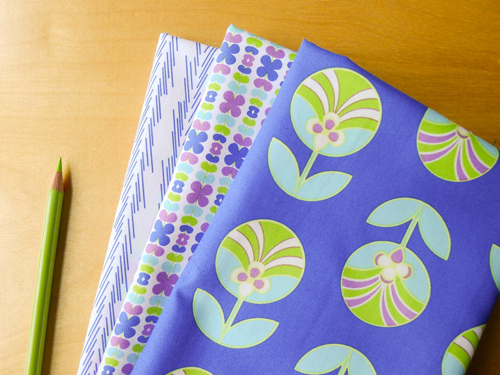 Oooh, gorgeous fabric bundle! Would love to win! There are so many great fabrics in stock at Tactile! 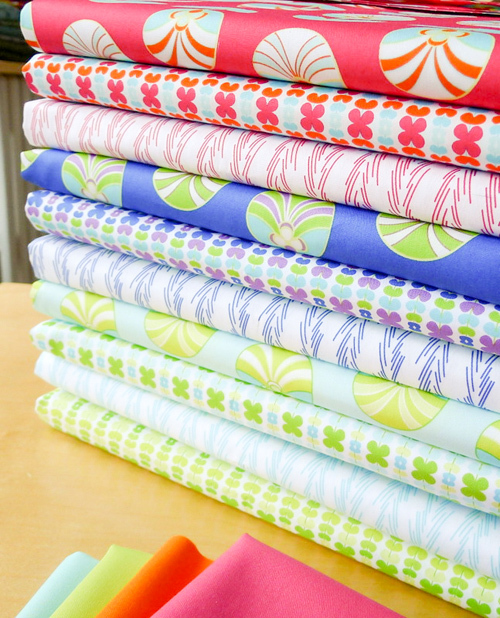 The Sweet Tea bundle of FQs is calling my name! The fabric looks amazing. I'd love to win! I love the orange paperclips from Type by Julia Rothman. I need more orange in my stash! Color me SMITTEN! ;-) Much love! I like her bundles by color - she has an amazing lime green bundle she calls Green Bunch. Too cool! I would love to have your fabrics. When I'm living in this cold winterland, I think of spring when I see these fabrics. I'd really love to win. Thanks for this giveaway. Such a beautiful line...I love the clean and simple lines and fresh colors...thank you for the opportunity! Love, love, love the new fabrics. Colors are so wonderful! What a great giveaway! If I win, I am going to revamp my kitchen by making all kinds of potholders and dishtowels with your fabrics! Maybe even a cafe' curtain! Thanks Jenni! LOVE this fabric. LOVE it. I love all of these fabrics! Great color and design! I love the idea of Mondays being giveaway day! I like Jessica Hogarth's 'Velocity' line! Oh how lovely - I would love to win these fabrics - designs are running through my head. I looked at their fabrics and am drawn to the Stof Pure line...very nice! Amazing giveaway bundle. Love it. Just checked out their site...beautiful selection...my favorite is Type! I love the modernology fabric. It's my favorite! Beautiful colors and fabric which would look great in a quilt for one of my nieces graduation gift this year. I like how bright and cheerful the colors are. They would brighten up any room as well as put a smile on your face. Love your new line! Thanks for the contest! I really like these fabrics and they are sure to become part of my stash whether or not I win! Thanks for sharing. Congrats Jeni!!! So super exciting! Your fabric is beautiful! Lovely and there is a color way for me, my daughter, and my new daughter-in-law!!! Love the citrus beads! She has some great fabrics! Just went to Tactile and I love the paperclips! I love these colors - especially the blues. Just checked out the shop and she has so many of my "must haves"! Type, hot chocolate, salt water! Can't pick a favorite but think I will be ordering something very soon! Thanks again! My favorite fabric in her shop is Salt Water (blue bubble shells) by Tula Pink. After visiting Tactile Fabrics, I found that she has so many that I like but this bundle really stood out to me, NEW Bundle - Color Block Trio - (3) Piece FAT QUARTER. I like how the orange polka dots stand out and bring out the other colors. I like all those colors! Thus fabric is gorgeous!! Thanks for the chance to win some!!!! Oh Jeni, I love your fabric line! perfect! The solids look so good with each stack! I've been waiting for your fabric to come out, thanks for the chance to win some! I just love this fabrics, they are so cute and perfect! Such pretty fabric! Thanks for the giveaway! So sweet of them to do a giveaway of your beautiful line! Thanks for the opportunity! I like that there are color bundles, because that's what I need more than a specific fabric most of the time. If I had to pick one favourite, it would be Nordic Diamond Turquoise right now. I love the green/ light blue colors. very nice. thank you for a chance to win some. Love the colors in your fabric line. They make me smile! Thanks for the chance to win some. I would love to win this bundle of your beautiful prints! Thanks! Love your line-just my style and colors. Thanks for the chance. Love the Hot Chocolate Geo and Zigzag on the Tactile Fabric site! Bought some of the Stof Pure at my LQS and love it. Would love to get some more and Tactile seems to have a great selection. Wonderful giveaway! Thanks for the chance- love this line!! Congratulations on your gorgeous fabric line. Here's to many more! This fabric is so pretty, would love to win! And I'm going to have to go with Tula Pink's Salt Water... I ADORE the octopus print! I love Type by Julia Rothman - I bought a few of the prints and think I need to get the rest! Thanks for the giveaway! Such pretty fabric! Thanks for the opportunity! Thanks for a chance to win this great bundle. I would have to say my favorite at Tactile IS Color Me Retro! I love all the Stof Pure at Tactile Fabrics. Color Me Retro is such a fun line! Thanks for the chance to win! I'm excited to see these in person! These are such lovely fabrics! I like the Dandy Blue fabrics, love that shade of blue. Would love to win! Such pretty fabric! Favorite besides Color me Retro??? Geo in White! Modern Citrus Bundle - Robin Zingone for Robert Kaufman - FAT QUARTER Would be one of my favorites from Tactile Fabrics. I love the bright colors of your fabrics - thanks for the give away! thanks for the giveaway, I love your fabric line!! Congratulations on the release of your fabric line! I think it's beautiful, and would love to have a fat quarter bundle to sew with! Thanks for the chance to win. I would love love love to win! Such a wonderful fabric line and these combinations- adorable!!! Lovely fabric, thanks for the give away! I love your fabric! Thanks for the chance to win! I love that Hot Chocolate Geo in white, never seen it before and it's gorgeous, adding it to my list of future purchases! My favorite fabric carried by Tactile Fabrics would have to be the Chicopee line by Denyse Schmidt. I recently bought a design roll of the line, but have been coveting more yardage of some of the prints. Spring has sprung with this collection for sure! Love these bright colors and fun patterns! Wow, love them all! Thanks for the giveaway!! What fun! I would love to add this to my fabric stash. These would make a great patchwork summer bag! I had not been to Tactile Fabric's site before, but I think their fabric collection is excellent! I like the Whale Watch in Shroom from Birch Fabrics (actually I like all of the Birch Fabrics prints they carry), and would also love to get some of Daisy Janie's new line, New Leaf. 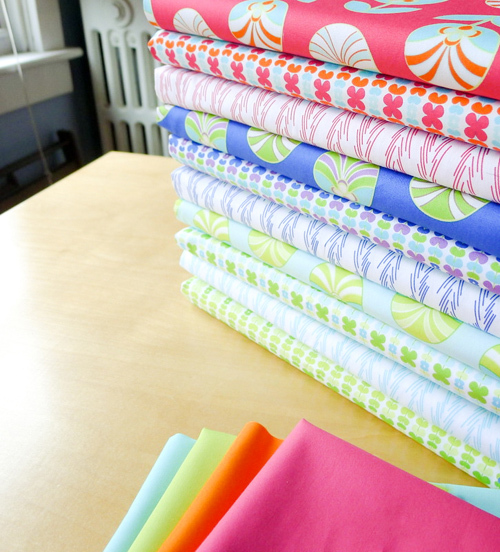 I would love to win a bundle of your pretty new fabrics! Thank you! I visited Tactile Fabrics and was excited to see she still has Bella available. I have been wanting to pick up some of that tree print. Lovely! My favorite item in the shop is the Salt and Pepper bundle. eek! I love color me retro, so excited for a giveaway! my second favorite is the architexture bundle! I love this line of fabric! Wow, what a great shop, thanks for the headsup! 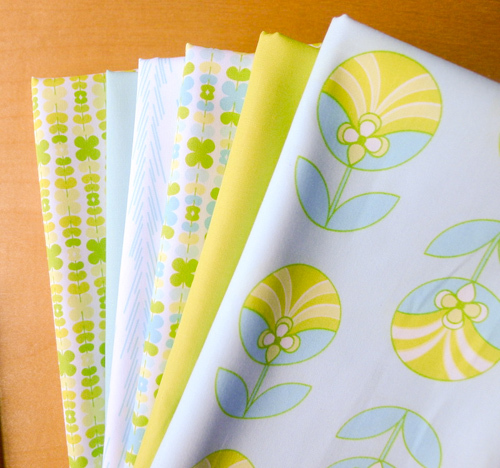 Hard to choose just one but I am loving the Organic Daisy Janie New Leaf 1/2 yd bundle! Your fabric is beautiful!!!! Thank you for the giveaway. I love your fabric! How exciting for you and us too! I love the Daisy Janie bundle! I love the hot chocolate zig zag and your fabric too of course! Thanks for the chance to win, love the giveaways! Lovely fabric Jeni! Cannot wait to create with some! Love all of the Stof Burst designs, any would be lovely on the back of a quilt. I think my favorite thing she carries would be her architexture bundles ... love that line too! In the Tactile shop, I love the Stof white burst prints! Would love to win some of your gorgeous fabric ;) Fingers crossed! Loving the paper clips in orange from the Tyoe collection. I like their Hot Chocolate Geo in white. I love your new fabric! 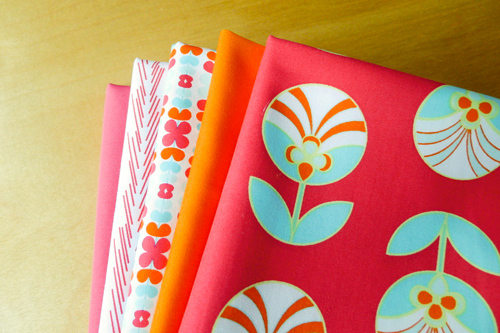 I am also loving the new Daisy Jane fabrics! I love the Color me Retro colors! Thanks for having this giveaway. My favorite item at Tactile Fabrics is the blue bundle of Architextures! What a wonderful giveaway! I love the colors! Wow - amazing giveaway!! Thanks for the chance!! ahh! would love to have some of your fab fabric!